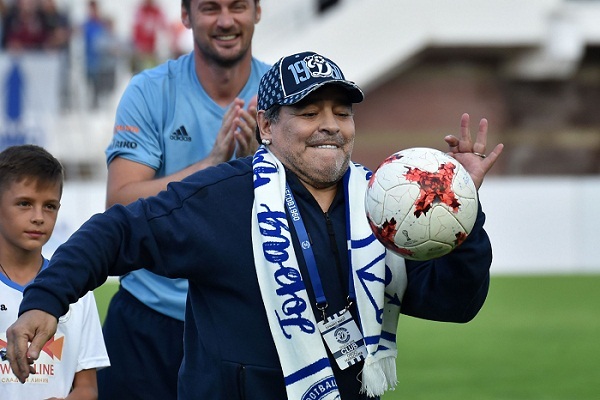 Hotfoot from creating a stir at the World Cup Diego Maradona arrived in Belarus on Monday to begin the latest chapter in his colourful career. Argentina's 1986 World Cup winner insisted that his new role as president of first division Dinamo Brest was "very serious" and said he hoped his presence would help the country's sport "get better every day". The 57-year-old also expressed a wish to meet authoritarian Belarusian President Alexander Lukashenko. "I have very good memories of Fidel Castro, (Hugo) Chavez and (Moamer) Kadhafi and I also know Putin," the former Argentinian number 10 said at a news conference, listing late leaders of Cuba, Venezuela and Libya and the current Russian president. "Now I want to do a photograph with Lukashenko," he said of the former collective farm boss who has ruled the ex-Soviet state with an iron grip since 1994. "I hope after that he will become our fan," he added, speaking Spanish in translated comments. Lukashenko is better known as an avid ice hockey player. The Argentinian spoke of his desire to settle in Belarus, which is sandwiched between Russia and Ukraine and EU members Latvia, Lithuania and Poland, saying he did not fear the cold. "When I was small, I had no shoes and I walked barefoot. So I'm not afraid of snow. I can live in Belarus without any problems," said the Argentinian, who grew up in a shantytown. He also said he was planning to learn Russian. Maradona signed a three-year contract in May and was set to watch his first match as the team's president on Monday evening, at home against fourth-placed Shakhtyor. Dinamo Brest are sixth in the table just before the halfway point in the Belarusian league season. "We'll try to create a team that will battle for the best places," said the former Ballon d'or winner whose infamous "Hand of God" goal against England helped Argentina win the 1986 World Cup. One of the greatest players of all-time, he became an increasing subject of ridicule at the World Cup in Russia. He made an obscene gesture from the VIP box to celebrate Argentina's dramatic 2-1 win over Nigeria which sent them into the last 16, drawing plenty of criticism. Even after his country's exit at the hands of France, he managed to keep himself in the limelight claiming that he would turn the team's fortunes around if named coach, and then being rebuked by FIFA after ranting about the officials following Colombia's loss to England.